Bach wrote about the divine in his music, but in his own character, he was very human; he had a bad temper and he was prone to grumbling. But did he grumble that his choirs were too small? This fine new version of BWV 232 by Jan van Veldhoven says not; it uses two singers per part for the chorus – the idea of ‘ripienists' – set against the ‘concertist' solo singers. 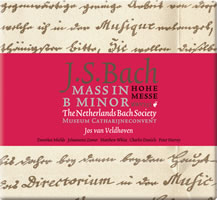 The musicological implications of this recording, which is a Netherlands Bach Society production, will in any case not trouble straightforward music lovers. It is admirably sung and played; the chamber scale, the deliberate integration of voices and instruments are very winning. Among the soloists, Johannette Zomer's impeccable soprano stands out in the Laudamus te and Christe eleison – a name new to me, but apparently a rising star actually billed as the solo highlight of the recording. In order to emphasise the work's liturgical value, the CDs come with a mini coffee-table book containing photos of artworks and precious objects related to the Mass. But van Veldhoven, in his introduction, does deliberately engage with the question of scale. Through the advocacy of Joshua Rifkin above all, the ‘as small as possible' party has gained currency. Among a myriad speculations to what Bach might have wanted, including analogies from his vocal writing or those of his contemporaries, there does exist a letter in which Bach appears to be asking the authorities in Leipzig for three or four singers per part. But that might not be the meaning of the letter at all and whatever Bach was used to having might not have been what he would have wanted in ideal circumstances. This may not be the case in the Mass, but then again, this is a Lutheran work, where the individual relationship with God (as exemplified by a smaller choir) is more important and the difference and specialness of the priest is less so. Do the instruments overwhelm the small numbers of singers? Van Veldhoven's integrative approach ensures they do not. The Gloria has real exultation; the Agnus Dei a genuine sense of completing a spiritual journey. Authenticity is not a fixed concept – there are great variations in the twenty-odd ‘authentic' Bach Masses that have been recorded since the first (Harnoncourt 1968). Indeed, just on the question of soloists and choir, it is common for one to reinforce the other, or for different choral numbers to have different numbers of performers within the same version. And as many commentators have stated, most vividly John Eliot Gardiner in radio presentations, we certainly don't expect modern listeners to go into draughty, unheated churches, sit on hard benches and listen to the movements of a single cantata spread out in the course of a service of several hours. We know that Bach never heard this Mass performed in its entirety; we don't even know why he wrote it out (near the end of his life) as a single work. This version, which is on SACD, is entirely recommendable and goes to the head of a very long queue of Bach B minor Masses. If you do prefer larger-scale versions, you may find a few passages (such as the opening of the Credo ) lack weight, and you won't want this as your only version. which discusses also a number of other thorny questions such as diction, tempi and pitch.